Home » Sports » Basketball » NBA – Are the 76ers a Value Bet for the Title at $15? NBA – Are the 76ers a Value Bet for the Title at $15? In Joel Embiid, Ben Simmons, and Jimmy Butler, the 76ers already had one of the best trios in the NBA. The acquisition of Tobias Harris gives them a legitimate 4th option that most teams would kill for. Having now moved into $15 for the title, are they now serious contenders out East? Having largely gone under the radar for his NBA career, this season marked the first that Harris got significant All-Star consideration. Whilst Harris has been a solid contributor throughout his career, it has been the last 3 seasons where his performances reached another level. He revamped his game considerably, improving his shooting to the point where he consistently averages over 40% from 3. Harris was a leading performer on the upstart Clippers this season, averaging a shade under 21 points and 8 rebounds. Whilst an Anthony Davis trade is sure to garner a lot of attention, Harris could definitely have more of an impact come playoff time. Whilst the Sixers aren’t an incredibly deep team, the lineup of Embiid, Simmons, Butler, and JJ Redick has been among the league’s best. However, they lacked that 5th piece that could reliably guard on the perimeter and shoot the 3. They thought they’d acquired that piece in Wilson Chandler in the off-season, however, he struggled to find a consistent role. Harris comes with a much higher pedigree than Chandler at this point and should be able to compete against Eastern Conference elites like the Bucks, Celtics, and Raptors. Tobias Harris's shooting is such a good fit for the Sixers' starting five. Perhaps the best part about this trade for Philadelphia is that they gave up little of consequence this season. The main assets in the trade are definitely draft picks, which shouldn’t impact their on-court performance this season. 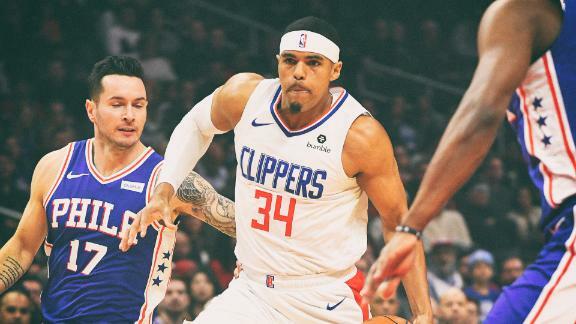 Even fan-favourite Boban Marjanovic and Mike Scott can provide value for Philly off the bench, whilst the losses of Chandler, Landy Shamet, and Mike Muscala are relatively inconsequential. Especially as rotations get thinner in the playoffs, this trade gives the Sixers a very strong and versatile top-8. A lot will fall on former Boomers coach Brett Brown to maximise the on-court performance of this talented group. On paper, the Sixers now have the talent to compete with top Eastern teams like the Bucks, Celtics, and Raptors. A potential issue that could arise is the lack of familiarity and continuity with the roster. With just under 30 games left this season, Harris will need to adjust quickly into his new role. As the consummate professional whose game fits well with that of his teammates, this shouldn’t be an issue. Whilst Victor Oladipo’s season-ending injury was very unfortunate, it leaves only 4 real contenders out East. This means that the Conference Semis are the bare minimum for Philly this season, but they’ll no doubt hope for more. Embiid – Simmons – Harris – Butler – Redick is arguably the best five-man lineup in the Eastern Conference, and with so much size and versatility, it'd be a load for the Warriors to handle in a potential NBA Finals series. The Sixers are really going for it. Having been a top-30 player in the NBA this season, the Harris trade definitely improves Philadelphia’s title chances. They’ve definitely gone all-in on this season and strengthened one of their major weak points. Milwaukee, Boston, Toronto, and Golden State all loom as strong potential rivals. That said, the Sixers now have an excellent 5-man lineup that can compete against each of these sides. At $15, there appears to be significant value on this Sixers side and I see this price continuing to drop.